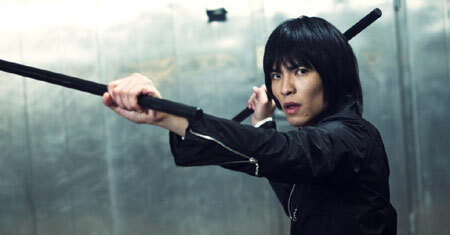 Jam Hsiao gets tough (sort of ) in The Killer Who Never Kills. The Skinny: Entertaining, ridiculous and so lightweight that it becomes instantly forgettable. Jam Hsiao fans will be happiest. by Kozo: It makes next to no sense, but The Killer Who Never Kills can entertain – especially if you’re watching for Taiwanese singer Jam Hsiao. Popularly known from Taiwan’s “One Million Star” singing contest, Hsiao stars as Ouyang Bonsai, a super nice guy who follows in the footsteps of his uncle Tricky (Eric Tsang) to become a professional killer. Tricky is retiring and recommends Ouyang to be the new hitman for mob boss “Stern Buddha” a.k.a. Jeff (Jeff Huang, formerly of Taiwan hip-hop group L.A. Boyz). But Ouyang is too nice to kill, and instead uses elaborate schemes where he pretends to murder his targets. With his helpers (Chrissie Chau, John Chang Kuo-Chu, Ma Nien-Hsien), Ouyang fakes his targets' deaths and gives them new identities and lives. Problems arise when Ouyang’s second target, sassy club girl Xiaoli (the always welcome Zaizai Lin) is targeted for extinction yet again – and by the way, they’re in love. Will Ouyang finally kill Xiaoli? Or will he cook up yet another scheme to fool Jeff and get everyone the mega-mega happy ending? The Killer Who Never Kills is based on a series of novels by popular Taiwanese novelist Giddens, who recently conquered Asia as the writer-director of megahit You Are the Apple of My Eye. Giddens’ original premise for Killer survives intact, but the screenplay was obviously massaged to fit Jam Hsiao. The script makes reference to Hsiao's singing career, plus it integrates Hsiao's Rubik’s Cube hobby and gives Hsiao free reign to act exactly like himself. Ouyang Bonsai is shy, unassuming and quite likable – basically how you would not imagine a hitman to be, which makes it weird that anyone would think Ouyang could be a killer - most especially his uncle Tricky, who instigates and enables the whole situation. This questionable credibility runs rampant throughout the film, as Killer Who Never Kills is bursting at the seams with conveniences and plot holes. There are too many places the storyline should fall apart, but it magically never does. Suspension of disbelief is now the responsibility of the viewer because the film does a lousy job of achieving any on its own. Notes:  Despite featuring a largely Taiwanese cast and taking place in Taiwan, The Killer Who Never Kills can be considered a Hong Kong film. Not only is one of its codirectors (Jimmy Wan) a Hong Konger, but producer Eric Tsang and co-star Chrissie Chau are also very much identified with Hong Kong. The kicker: the film was paid for in part by Hong Kong's government-sponsored Film Development Fund.